Handwritten letters are a great way to add a genuine, personal touch to any sales and/or marketing campaign. Our letters are written by actual human beings – no robots. Include drop-in items or send alongs, postmark the letter from your location, insert data merge values, and much more. We’re the first marketing automation company to offer handwritten letters natively built into an automated software platform – and we want you to experience the difference! We don’t use robots to write the letters. Based on the handwriting style you select (male, female, cursive, print, neutral, all caps, etc.) we select the best writer for the job. Each letter is curated with care, reviewed for errors, and photographed before delivery. Drop-ins are any item that you can add into the envelop without changing the weight and size. 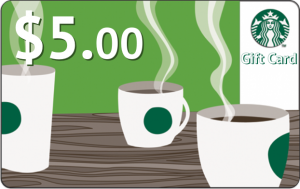 Include a $5 Starbucks gift card, your business card, a $20 Visa gift card, and much more. A send along are items like a book or bag of popcorn. Anything you can think of we can enclose it with your handwritten letter. All letters are sent out of our Texas facility. 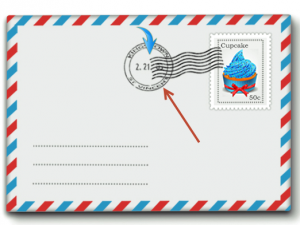 However, if you want to send it from your sales office, your headquarters, or anywhere else we can make that happen with the Unique Postmark Location feature. Enter in your city, state, and country and we’ll do the rest. Send a single handwritten letter to one prospect/customer at a time or include a letter in an automation. Start with one of our pre-built templates or create your own template. Add the Send Handwritten Letter action as an automation step. Send your handwritten letter on bi-fold or Crane & Co. stationery stamped with your logo. 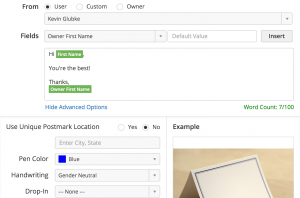 Include any standard field or custom field in the message body. After you send your letter, send a follow up email with our system that includes a photograph of the letter to remind the recipient what you sent. All of this is completely automated!